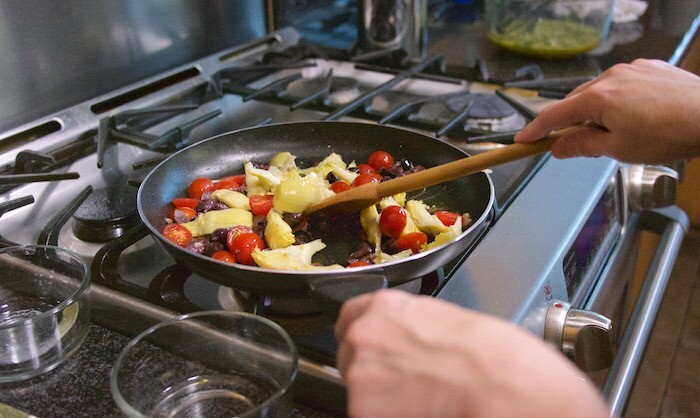 In the spirit of summer #TeamFarberware is encouraging families worldwide to go for the gold by preparing team style dishes that are family friendly and require minimal time and effort to put together. The first modern Olympics were held in Athens Greece in 1896 and since then they are one of only four countries to have competed at every summer game. Inspired by their sportsmanship and their need to maximize their strength with hearty meals, I came up with this Greek Style Frittata. This medal worthy dish of eggs, loaded with veggies is just one example of how you can have a healthy and delicious breakfast, lunch or dinner on the table in minutes. I used several pieces of non-stick cookware from Faberware's stylish 15 piece dishwasher-safe set to prepare this meal. Top-quality non-stick interiors make clean-up a breeze and the fact that they are dishwasher safe makes them ultra-convenient for those nights when you want to spend more time with family. If you love this dish and want to prepare it for your family or friends click through to Faberware to grab the full recipe! But before you do make sure to enter the giveaway below! I have teamed with Farberware to allow one lucky reader a chance to win a 15-Piece Farberware dishwasher safe nonstick cookware set. The set comes with one-quart and two-quart covered saucepans, 5-quart covered Dutch oven, 8-inch skillet, 10-inch covered skillet and a medium cookie pan. Looking for additional recipes and cool giveaways? Be sure to check out Faberware Cookware on Facebook and Instagram and follow #MyFamilyCooks on Twitter. I have an ongoing relationship with Farberware and will receive product and/or compensation for posts featuring their items. As always, all opinions are 100% my own. This giveaway is sponsored by Farberware and open to US residents only. The winner will be chosen using random.org and notified via email. Winner will have 48 hours to respond and in the event they do not, another winner will be chosen. I think black would be terrific! What a great greek inspired dish! My first instinct would be the blue because of the color of our kitchen, but I would probably get the black. I would love to own the Nonstick Cookware Set in black!! I would choose the Champagne color! I would pick the black color. I would love choose the classic black. Wow, great giveaway! And Greek flavors are so good. Yum! I'd choose Pewter or Champagne. New friend via Farberware! Nice to meet you!! Love meals that can be served either AM or PM - this frittata fits either time slot very nicely!! Awesome set of pots/pans - thanks to you and Farberware for the magnificent opportunity!!! Good luck, y'all!! I like the black one I think. Everyone is commenting about the giveaway, but I wanted to say that I love this Greek frittata! Looks delicious! I would choose the black color! I love frittatas. We often have them for dinner when I need to use up leftovers. This Greek version sounds delicious...since I happen to totally love Greek food. I would get black because I love everything black! I don't eat eggs, but I love to make tofu frittata. It's one of my favorite go-to breakfasts when I want something hot. Yum! You've got all my favorite flavors going on here. I love frittata! And I love pans that are dishwasher safe. Good call! I choose black. Thank you. Oh they are all such beautiful colors! I think I would choose the blue! Never tried a greek frittata before. Beautiful colors. I love the red set. Great giveaway! I love that the pans are dishwasher safe. Love all those Greek flavors! Wow, this sounds like a great giveaway! Pretty much everything you need! I'm loving the sound of that Dutch oven! 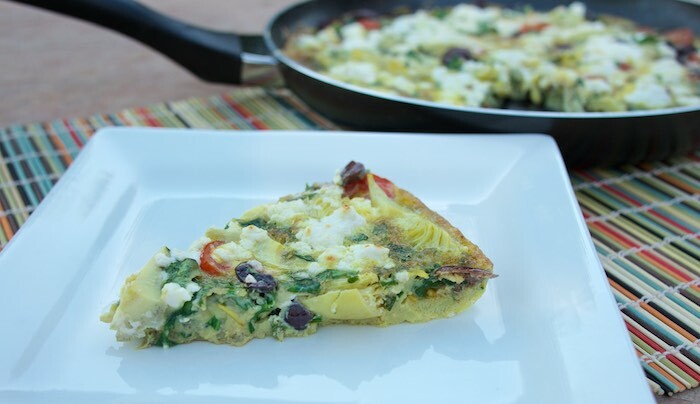 I love a frittata and I love Greek flavors and ingredients! I know I'd love your frittata! I'm in dire need of some new pans. Love the high performance stainless steel set! And YUM on this frittata, looks amazing! Lovely frittata and great giveaway! I would choose the Aqua color! Love it! This looks delicious. I love frittatas. The Greek inspired ingredients are awesome! Yum! LOVE the ingredients you chose to include!! The champagne color is so pretty! That is such a tasty frittata! Love the addition of feta in it. I'm so happy that I can make a Greek frittata with vegan products because this sounds really good to me right now. would love to have these for breakfast! Thanks for sharing this recipe. Non-stick cookware makes clean up a snap! This frittata is perfect for brunch this weekend! Love my nonstick cookware! This frittata looks delicious! Ooh! This would be perfect for breakfast tomorrow! I have a set of Faberware that I have been using for years now- they make great products to last! I like all of the options. Leaning towards black but the champagne is gorgeous too!! Love the look of this recipe! Looks super easy and healthy. I'd love to win in RED! I love the champagne color! I couldn't find color choices. I'd go with slate, if available, but I don't really care. I have never made a frittata, but I love greek anything eggs, I need to make this. I just made a traditional shakshuka last night... beautiful way to enjoy eggs for breakfast, as well. This frittata looks fabulous! I'd choose the champagne set - perfect color, clean and eye-catching. I would choose the black cookware set. I would choose the black set. What a great recipe. If I won I would choose the blue color. I would love to choose the black set. Food Hunter is always so interesting, informative & fun! I would pick the champagne! COngrats on the win Jeni!